Okami left Taliesin in 1930, traveling to Europe to meet Le Corbusier before returning to Japan. 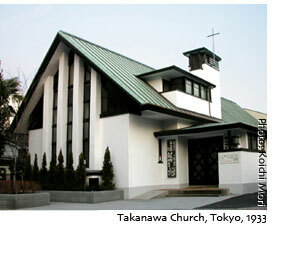 In 1933, he designed the Takanawa Church, featuring exuberant homages to both Taliesin and the Jiyu Gakuen school. His 1937 Kyoei Joshi Gakuen Memorial Hall was also deeply Wrightian.